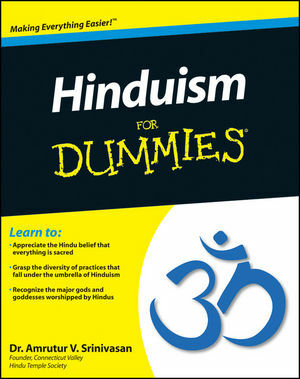 If you've heard of this ancient religion and are looking for a reference that explains the intricacies of the customs, practices, and teachings of this ancient spiritual system, Hinduism For Dummies is for you! Dr. Amrutur V. Srinivasan, born in India, is primary founder and first president of the Connecticut Valley Hindu Temple Society. He has functioned as a Hindu priest performing a wide variety of pujas (worships), weddings, and other ceremonies since 1971. Chapter 1: A Quick Overview of Hinduism. Chapter 2: From Past to Present: A Condensed History of Hinduism. Chapter 3: Hinduism’s Core Beliefs and Values. Chapter 4: Major Hindu Denominations. Chapter 5: The Structure of Hindu Society. Part II: The Hindu Pantheon and Its Religious Leaders. Chapter 6: Pantheism to Polytheism: From the One to the Very Many. Chapter 7: Hindu Gods and Goddesses. Chapter 8: The Avatars of Vishnu: The Divine Descent. Chapter 9: Revering the Role of Religious Leadership. Part III: The Sacred Texts. Chapter 10: The Vedas: Centuries of Accumulated Treasures. Chapter 11: Gaining Higher Knowledge with the Upanishads. Chapter 12: Living with the Epics and Puranas. Chapter 13: The Song of the Lord: The Bhagavad Gita. Part IV: Hinduism in Practice. Chapter 14: Worshipping at Home. Chapter 15: Worshipping at Temples. Chapter 16: Holydays and Festivals. Chapter 17: Cradle to Cremation: The Life-Cycle Rites. Chapter 18: Taking a Pilgrimage. Part V: Delving Deeper into the Hindu Concept of Reality. Chapter 19: The Six Schools of Thought: The Darshanas. Chapter 20: Vedanta: The End of Knowledge. Chapter 21: The Yogic Path to Salvation. Chapter 22: Ten Common Questions About Hindus. Chapter 23: Ten Common Prayers. Chapter 24: Ten (Plus) Traditional Mandates.